Subscribe to The Extraordinary Team Newsletter and receive your FREE special report, “How to Engage in a Collaborative Conversation” by Kristin Arnold. 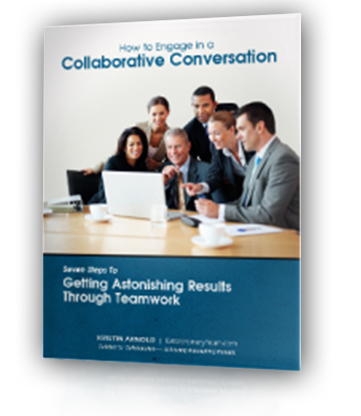 In the special report, you will learn seven steps to getting astonishing results through teamwork. Sign up now! The Extraordinary Team is a free, monthly, electronic newsletter written by Kristin Arnold and dedicated to galvanizing leaders and their teams to achieve extraordinary results. We respect the privacy of our clients and customers. We never sell, lease, lend, or otherwise share our lists.